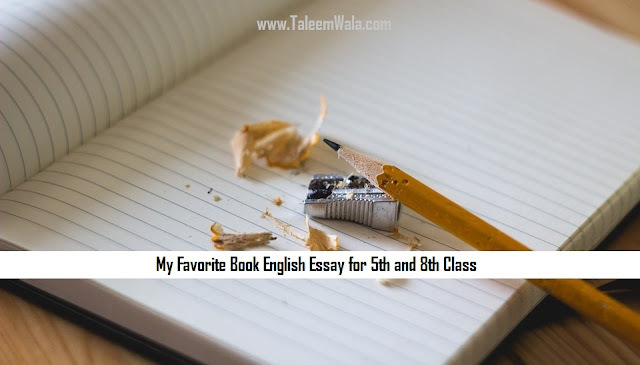 If you are searching for an English essay on My Favourite Book topic and for 5th or 8th class students in Pakistan then this is the page where you can read and download this essay for free. This great note on my favorite book essay is for Pakistani students in primary and middle education classes. Books are our best friends. They give us a lot of knowledge. I love to read books. Therefore, I have many books. But one book is my favourite. It is my English Book of eight class. Its name is ... It has more than 50 lessons. There are 450 pages in it. It is self-explanatory. There are beautiful and multi-coloured pictures in it. It contains many appealing and moral giving stories. It also has a lot of exciting and interesting poems. I have learnt a number of poems from it. bought it from my school bookshop. Its price is Rs. 100. This book is my best friend. It teaches me good manners. I like it very much. If you need to read more essays then share this article with your friends and we will update you with more essays.